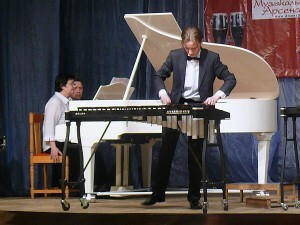 From 25 to 27 of March 2011 the II Moscow Regional Open festival “DRUMSFEST” was held. The fact that this competition was supported and carried out for the second time (first – in 2010) proves that this is not a one-day-competition. The number and the entry list of the participants have showed that to the full! In total, according to all the nominations, including “Ensembles of percussion instruments”, more than 120 competitors took part in this competition! The number of the ensembles has also increased to 15 and was appreciated by the higher public interest in this nomination. 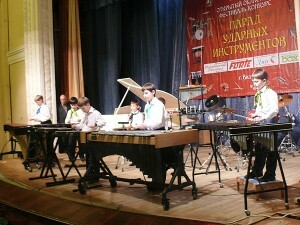 It was a great show when the ensemble of Municipal center of Spiritual culture “Svyato-Georgiyevskaya gymnasium”, which later became the winner in the nomination “Ensembles of percussion instruments”, was performing before the beginning of the festival. The show of a great interest was also the performance of the ensemble “Time to live” (“Vremya zhit”) from Children’s School of Art of Vidnoe city, which was amazing and fiery together with our guests from Syzran city. The participants were the representatives from not only the Moscow region but from Surgut, Saratov, Engels, Syzran, Tula, Rostov-na-Donu, Nizhniy Novgorod, Asbest and Moscow. For most of the competitors it was the second time when they came to take part in this competition and that proves the importance of the festival for them. As it was noticed by the jury members, the participants who had come to the III competition “DRUMSFEST”, showed an extremely high level of training and the teachers – their professionalism and teaching mastery skill. As at the I competition, the II Open competition had the greatest and the most competent jury in orchestral drums nominations: Ludmila Krasilnikova, Gennadiy Butov, Konstantin Semyonov, Igor Tsitrin, Alexander Suvorov. В состав жюри по номаниации «Ударная установка – соло» вошли известные рок-музыканты Sergey Efimov (ex-band «Kruiz», band «Hippi Haos»), Aleksandr Yerokhin (band «Lyube»), Aleksandr Anikin (drummer of the band «Karnaval»). 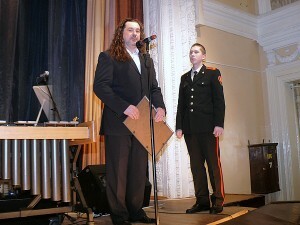 The president of the jury in this nomination, by tradition, was teacher of Moscow State University of Culture and Moscow State Musical College of Pop and Jazz Anatoliy Makurov, popular for the readers of the magazine «MUSICBOX» with his articles on researches and teaching the drum kit arrangement. In the Program of the festival there were not only the competitive performances but the master classes of the leading Russian teachers – jury members. Also there was the open lesson of teacher Aleksandr Griroryevich Bilenkiy. In the lobby of the festival there was also a trade exhibition of percussion instruments from the leading companies all over the world. At the competition the new talents and names from all over Russia were opened. The Grand Prix was given to the participants from Nizhniy Novgorod, Yekaterinburg, Tula and Surgut. And, of course, everybody was amazed by the mastery skill of the students f Moscow State Musical College of pop and jazz art. At gala-concert of the last festival as a guest Sergey Efimov’s band “Hippi Haos” performed. One of the most important index of the level of the competition was the prize fund. For the second year we’ve got response and understanding of the biggest chain of music shops in Russia – “Muzikalniy arsenal” and the company “FORTE” producing xylophones. General Director of “Muzikalniy arsenal” Vitaliy Zharkov at once suggested having a Grand Prix and awarding the winner with the drum kit MAPEX. 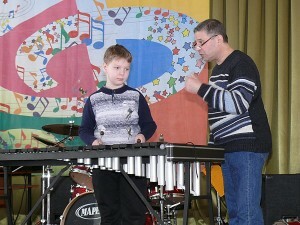 And Aleksey Rakhmanov – director of ”FORTE” – suggested giving a xylophone as one of the prizes. The permanent information support is being given by the magazine «MusicBox». A great number of positive aspects are shown thanks to this festival: there is the showing up of the skills of young performers, popularization of drums performing art, qualitative increase of the performing level, extension of the teaching qualification, qualification of directors at children’s musical schools, academies, colleges, studios and rock clubs not only in Moscow and the Moscow region but the other Russian regions. In 2012 there will be the III festival-competition. And that will be an outstanding event for young drums performers as it has already become a pleasant tradition for them. To run a few steps forward, we can say that the participation of far abroad competitors is being planned, and this fact will essentially increase the competition status. In the Program of the competition there will be some changes, connected with the organization. Now the competition in the orchestral instruments nomination will be held in 2 rounds. To participate in the III Moscow Regional Open Festival “DRUMSFEST” you should learn more about the Program, conditions of the competition and apple for the participation. More information you can find in the corresponding sections of our website.